This was one of those storms that people will talk about for years, especially those that were directly affected by it. It all started with three separate shortwaves that all phased together once off the Mid-Atlantic coast, far enough offshore to limit any direct effects save for some unusual late season snow and gusty winds the next day. The highest impact area included Cape Cod, Nantucket, Nova Scotia, and New Foundland. I’m sure any ships that were in the vicinity were not happy with this situation! GOES-Sounder RGB Air Mass animation valid 03/24/14-03/26/14. 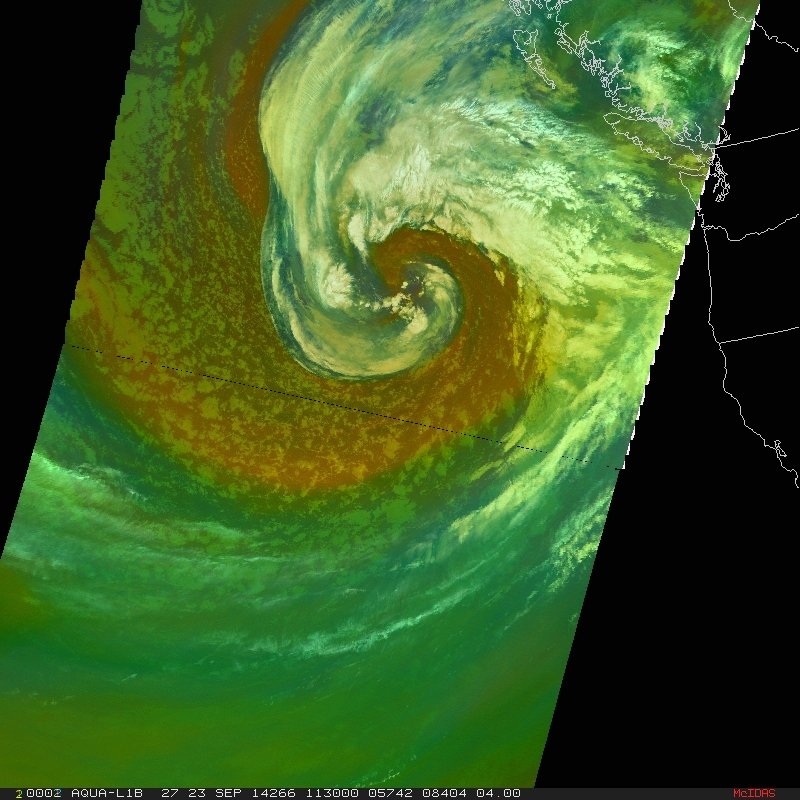 The evolution of the nor’easter can be seen in the GOES Sounder RGB Air Mass animation above. A southern stream system originating in the Gulf of Mexico moved east of Florida while two other shortwaves dropped southeast out of Canada. All of the pieces combined near the North Carolina coastline, but the explosive deepening took place as the combined system moved northeast away from the Mid-Atlantic. There appears to be a few stratospheric intrusions, but the most impressive intrusion occurs with the final shortwave as noted by the dark oranges and reds that appear at the end of the day on 03/25. When models are forecasting a phasing situation, this product can be quite useful in identifying the features and observing the stratospheric drying seemingly “bleed” from one shortwave to the other. MODIS RGB Air Mass product valid at 1540 UTC on 03/26/14. MODIS RGB Air Mass product with ASCAT winds overlaid valid at 1540 UTC on 03/26/14. The two MODIS RGB Air Mass products above show the nor’easter near peak intensity. Notice how distinct the gradient between oranges and greens is in this image, almost as though you can see the upper portion of the frontogenesis, well behind the actual front. The intensity of the stratospheric intrusion is quite evident by the dark pinks near the center of the cyclone. 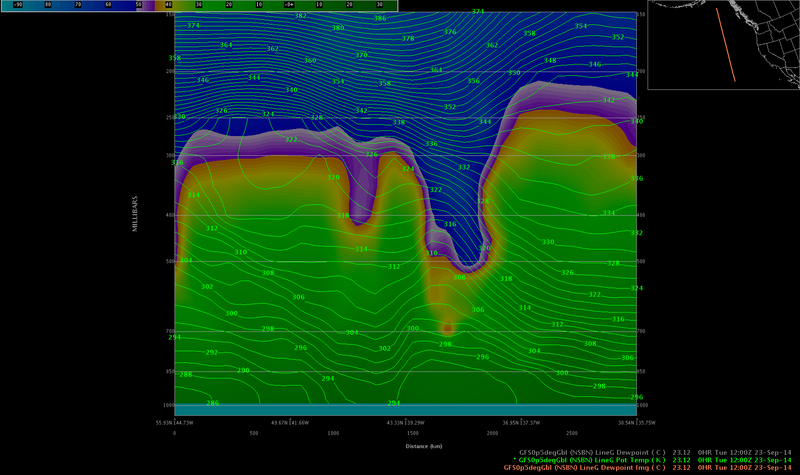 The second image shows the wind field overlaid from ASCATB. Notice the large area of hurricane force winds (red wind barbs) near the bent-back front, in the comma-head of the cyclone. This area of wind affected parts of Southeast Massachusetts, including Nantucket where winds gusted from 60-85 mph. Nantucket recorded a wind gust of 82 mph and about 10″ of snow. Meanwhile, Nova Scotia bore the brunt of this beast with wind gusts of 129 mph at the Bay of Fundy and 115 mph in Wreckhouse. Waves were equally impressive with altimeter readings between 40-50 ft and a buoy report of 52.5 ft.
GOES-13 Infrared imagery with the GLD-360 30-minute lightning density product overlaid. Another interesting aspect of this storm was the two distinct areas of thunderstorms that erupted. I overlaid the OPC and TAFB offshore zones for reference. Notice well east of the Bahamas there are possible supercell thunderstorms associated with the southern shortwave energy. Meanwhile, as the strong northern stream shortwaves exit the NC coastline, two areas of thunderstorms developed with the easternmost storm exhibiting supercell characteristics. Although the lightning was not as intense with this northern area, I would speculate that the storms were associated with very strong wind gusts due to the dry air associated with the stratospheric intrusion. VIIRS Visible image valid at 1719 UTC on 03/26/14. VIIRS Visible image with the 18 UTC OPC surface analysis overlaid. I’ll finish this entry with two VIIRS Visible images above showing the majestic beauty of this nor’easter. The 18 UTC OPC surface analysis depicts the storm at a maximum intensity of 955 mb, after a 45 mb drop in 24 hours! This qualifies as one of the most explosive cyclones on record. Another tidbit. . .this was the strongest storm in this part of the Atlantic since Hurricane Sandy (2012).